[There's supposed to be a video here](https://straypixels.net/assets/riftcore-decal-system/video/RiftCore_FinalShield.mp4), but your browser doesn't support mp4s! This is the third post in a series about the tech we used to put together Rift Core. If you aren’t familiar with Rift Core, you can check it out here. It’s an action RTS game about a squad of mechs who are desperately trying to save their world. In this post, I’ll cover one of the more elaborate VFX we built for Rift Core: the shield. There’s several components in the shield effect which all add up to the final result. I’ll cover each one in detail. [There's supposed to be a video here](https://straypixels.net/assets/layoutgroup-animation/RiftCore_StyleElements.mp4), but your browser doesn't support mp4s! This is the first in a series of posts in which I’ll be breaking down some techniques we used to put together Rift Core. If you aren’t familiar with Rift Core, you can check it out here. It’s an action RTS game about a squad of mechs who are desperately trying to save their world. In this post, I’ll be covering the general setup we used to achieve the look of the game. That means we’ll be talking about things like lights, cameras, and postprocessing effects. I will preface this article by warning you that I am a programmer, not an artist. This article is designed primarily as documentation for my future self. However, it may also be useful to those who, like me, are somewhat new to this whole 3D style business. [There's supposed to be a video here](https://straypixels.net/assets/cinemachine-intro/FLY2K-cinematic1-small.webm), but your browser doesn't support the video tag! I’d first heard about Cinemachine in passing when it was released for free for all users of Unity. “Oh, cool,” I thought. “I’ve never done cinematics before in Unity, I should give this a shot.” Unfortunately, after watching a couple of tutorials, I found myself confused about what Cinemachine really was. I ended up getting the impression that it was for film-makers exclusively - entirely out of the realm of my comprehension. I bet I am not the only one with these misconceptions. I believe that the tutorials and other official material out there presents Cinemachine in… sort of a misleading way, unintentionally. At the very least, the target audience for their tutorials is not programmers. I think it’s a shame that Cinemachine is not more immediately understandable, because it turns out to be an incredibly powerful drop-in tool once you do understand it. in this post, I’ll give a brief overview of how I’ve found it useful, as a programmer, to think about Cinemachine. Third-person camera implementations are always tricky to get right. It’s not hard to get a camera to follow a character around at a fixed distance and angle, but then you have to deal with those gosh-darn walls that are everywhere. Raycast from the player to the desired camera location (player position + separation distance). If the raycast hits a wall, put the camera at the raycast hit point. If the raycast does not hit a wall, put the camera at the original desired location. This works… almost. A problem manifests when the player is very close to a wall, and is caused by using a raycast in step 1. Recently I ran into a problem with Unity’s UI system. The problem is simple: How do I close a menu using a controller? If the player opens the options menu from the main menu, then hits the “B” button on their controller, they should be taken back to the main menu. Easily achieved by polling for Input.GetButtonDown in some component on the menu, right? Well, this works for most situations, but it falls over when some component needs to handle the cancel itself. For example, if a dropdown is open and cancel is pressed, then only the dropdown should close, not the menu. The Unity UI InputModule already has a field which takes a cancel axis - can we leverage that? There is some limited support for doing so, but it turns out to be somewhat more complicated than at first glance. If you’ve played Morrowind, you probably know exactly where this is - just outside Ald Ruhn in the Ashlands. Go north and you’ll find the small town of Gnisis, containing both a temple and Imperial guard post. To the east is forbidding Red Mountain, forever surrounded by the mystical Ghostfence. Just to the south you’ll find the Bitter Coast with its mushroom trees and dense marshes. 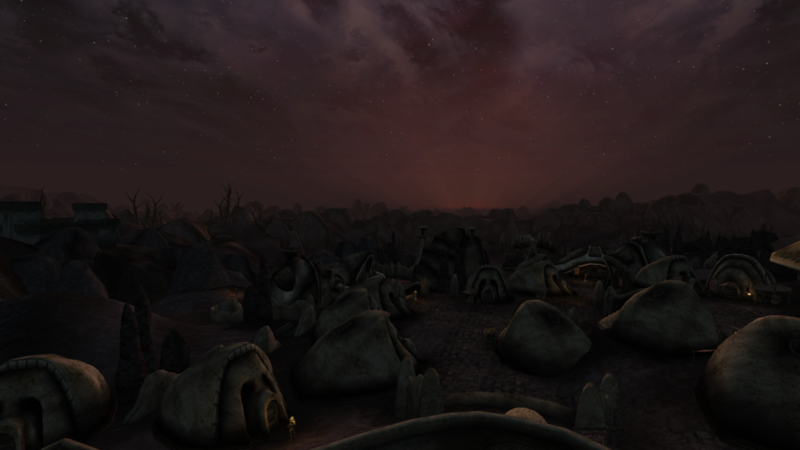 There are many things that make Morrowind special to me, but one of the foremost is the sense that I know the place. I’ve walked Morrowind from north to south. Its roads feel like home. I can still tell you, years later, the best routes to travel from Vivec to Tel Mora. I can already see some of you rolling your eyes. “Oh yeah, this old argument. Fast travel is bad, yadda yadda, but seriously - who wants to spend fifteen minutes in a video game just walking?” And you’re right! I love Morrowind, but even I am not immune to the tedium. These days, it’s the big thing that puts me off from playing it again. And yet, something always makes my mind turn back to Morrowind, and think - why did that make me feel the way it did? Note that this post contains spoilers for Morrowind, Dark Souls, and Subnautica. [There's supposed to be a video here](https://straypixels.net/assets/layoutgroup-animation/objectives_animation_2.webm), but your browser doesn't support the video tag! Imagine the following scenario: you have a list of objectives you want to show in the game HUD. Sounds simple enough to implement in Unity’s built-in UI system, right? Just throw a HorizontalLayoutGroup on a panel, insert your elements, and the panel will automatically size to fit. Instantiate new children as new objectives come in. However, when you add new objectives, it doesn’t look especially nice to have the UI expand immediately. Plus, you want to draw the player’s attention to the objectives list when it is updated. So, you decide to animate the objectives list. Using Unity’s built-in UI components, this turns out to be a bit difficult to do. There is no built-in support for animation in the UI system. How, then, do we go about animating this list? Get started playing sounds in Unity with an Audio Source! Here’s how to integrate Wwise into Unity! I needed something in the middle. Playing sounds using sources and listeners wasn’t going to cut it, and I didn’t have time to learn Wwise, as we were submitting our game to an expo in a month and we had zero sounds. Many sounds are less important than others (a gun firing, vs “You are under attack!”). Unity does support priorities on audio sources, but a higher priority only makes sure that the sound gets played; we needed the sound to play louder relative to other sounds. There are a ton of sounds going off, all at once. This especially presents an issue when a bunch of units all begin firing at once; this causes a very unpleasantly loud sound as the amplitudes add up. The sounds are all over the map, so we need 3D audio. Since the camera is overhead, we can’t use the 3D position to attenuate, we need to use the 2D position relative to the units. In desperation, I turned to Unity’s AudioMixer. Though most sources I’ve read around the internet say it’s not good, I managed to make it work. A note of caution, first, that I am not an audio engineer. I’m not even particularly good at audio stuff. This is just what I found works for our project - there are no doubt better ways to do it. With that in mind, below is a high-level outline of my solution. I’ve been using Unity’s free networking solution, UNET, in an RTS. On the whole, it works, but it doesn’t work especially well. Since UNET has to support many different types of games, the choices made by the developers lean towards versatility and flexibility, rather than efficiency. Case in point: the NetworkTransform. It supports many things out-of-the-box, including interpolation, rigidbodies, and variable send rate, but it makes tradeoffs in the efficiency department. Every time it syncs a transform, it’s sending position and rotation uncompressed. With 3 floats for position and 3 floats for rotation, that’s 24 bytes every time a sync happens. The entire Unity networking library is open source, so you can analyze the NetworkTransform yourself. The Unity Matchmaking Service enforces a per-second bandwidth limit of 4kb in pre-production mode. 4096/24 is about 171. Assuming 10 updates a second, thats means only 17 NetworkTransforms syncing at once - with no other traffic at all. Reducing the amount of bandwidth allows us to push the send rate higher than 10x a second, reducing the amount of interpolation needed along with the perceived latency. A couple of notes before we get started. First, a lot of this article is based on Glenn Fielder’s (Gaffer’s) snapshot compression article, which is applicable no matter if you’re using Unity or not. I’m going to be explaining a few concepts from the article, for completeness, but you should familiarize yourself with it before reading on. Second, you should be familiar with bitwise operations. Since we’re trying to save as much bandwidth as possible, we’ll be hand-packing bits.